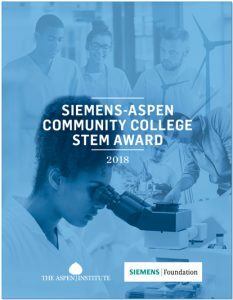 The Aspen Institute and the Siemens Foundation announced the eight winning community college STEM programs of the first Siemens-Aspen Community College STEM Award. The award recognizes the outstanding preparation and education these programs provide students seeking careers in science, technology, engineering, and math. Read the press release here.